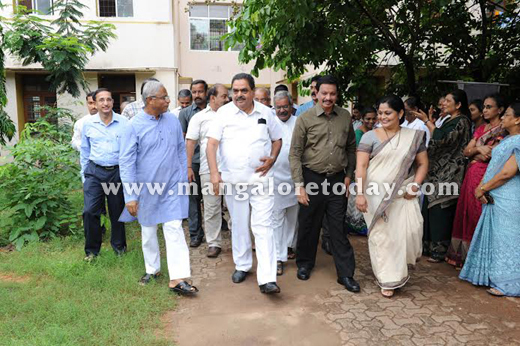 Mangaluru, June 14, 2015: DK District in-charge Minister and State Minister for Forest and Ecology B Ramanatha Rai on June 13, Saturday initiated the task of laying a herbal garden outside the premises of the Ayush Department of Wenlock Hospital in the city. The Garden will be developed by Aasare Charitable Trust and will have plants of medicinal value. Speaking on the occasion, the Minister appreciated the Trust for its kind gesture and added it was a good idea to develop a herbal garden in a hospital premises. Dakshina Kannada MP Nalin Kumar Kateel, MLA JR Lobo, Deputy Commissioner AB Ibrahim, former MLC Monappa Bhandary, Wenlock District Surgeon Dr Rajeshwari Devi, Buntara Yane Nadavara Mathru Sangha President Maladi Ajith Kumar Rai, Aasare Charitable Trust President Dr Ashajyothi Rai, Secretary Diwaker Saamani and others were present on the occasion.